One of the great things about visiting Winslow Homer: Making Art, Making History is that everyone who looks at Homer’s works reacts to them in a different way. They evoke different emotions, stories, and sentiments from every viewer. With Your Favorite Homer, we’ll ask some of the Clark’s employees to share their reactions to their favorite work of art in the exhibit. It’s also a complicated piece. “If you look at the landscape you could think it’s a peaceful scene,” she said. “But it’s really very dramatic—the representation of a struggle between life and death.” The contrast between the beauty of the landscape and the tension of the action is what initially drew Laura to the watercolor. The painting’s composition, however, leaves little doubt in Laura’s mind as to which side the artist was on. 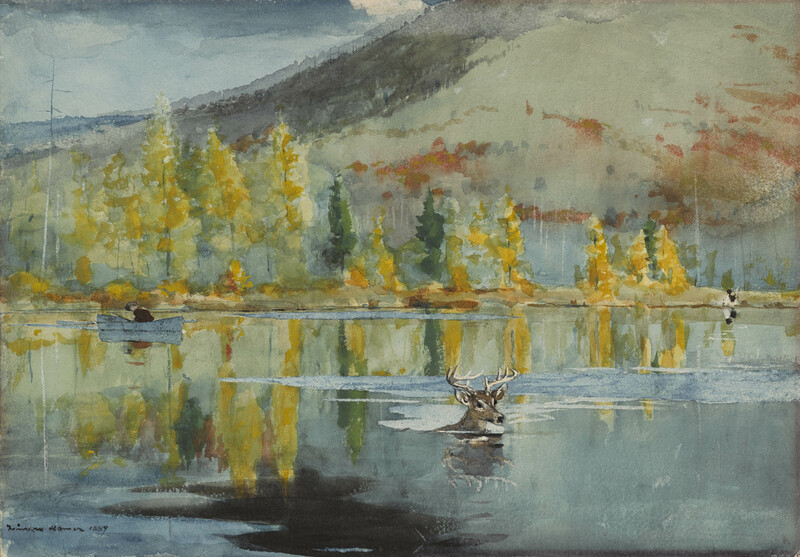 “I think Homer is trying to paint from the perspective of the deer rather than the hunters,” she said. Laura Bonito is a curatorial intern originally from Italy. She is at the Clark for the summer as a part of Massachusetts College of Liberal Arts’ BHIP internship program, which pairs students interested in museum work with area museums. She graduated last year from the University of Pisa, and is taking the opportunity to travel and enrich her CV while working on her PhD.